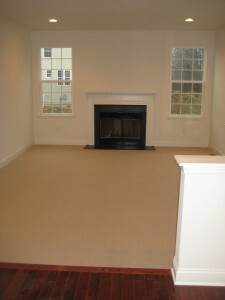 Once we got through choosing the exterior options of our home, we were sent to the design center for the interior. This place was ginormous. There wasn’t even a hole dug for our home yet, and the model we previously walked through had been sold, so it’s safe to say we had no clue what we were doing. Plus our wedding was less than 3 months away, so we were up to our necks in those choices. In fact, since we were short on time off, we did our floral/table design for the wedding, then shot over to the design center for our house options all in one single day. Yes we are crazy and that is why I got a case of the shingles shortly after…TMI. Anywho, we arrived at the design center to hear that they did not have our appointment in their book. Read above blurb about limited time off. So the “design” person we were supposed to work with had another couple in our time slot. There was nothing they could do for us that day, but told us we could work on our own. 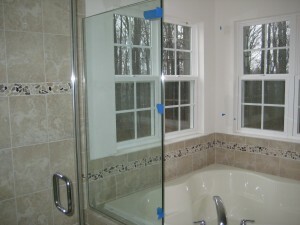 And with that, we chose almost all of our options that day, without any help, decoding the crazy builder price sheet. It took us more than 3 hours. 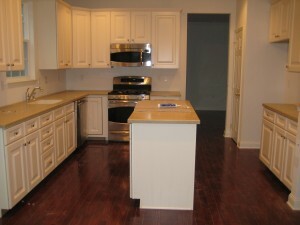 We also added a wide baseboard, which we loved. 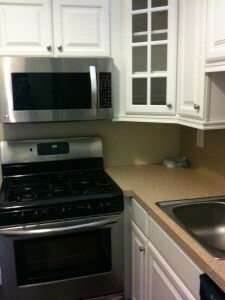 I always wanted dark wood cabinets, but with the dark floor and the lack of windows in our condo kitchen, we went with white…. So we definitely had ideas in mind. I wanted a very similar floor, and with my desire to keep the place light and airy, we decided to go with the ‘antique’ colored cabinets, which are slightly less white than the…white ones. 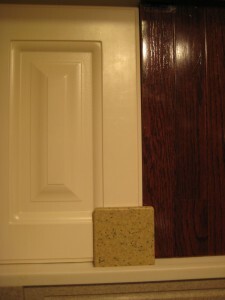 For hardwoods, it was much, much harder. First of all, the pricing list may as well have been in Spanish, so we had no clue what anything cost the first time around. 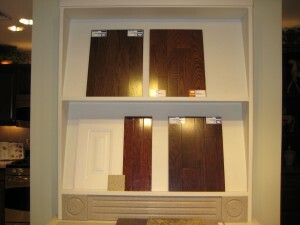 Second, of the hundreds of flooring samples, I wasn’t in love with a single one. They just were not rustic enough for me. That being said, once we found out the pricing, we decided to go with the least expensive option, in the darkest color and widest plank available. 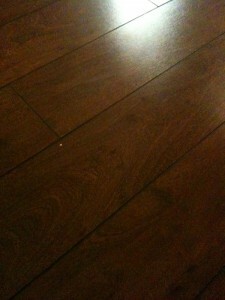 Which was the Bruce oak floor in Cherry, 3 1/4 inch plank…. The other options, some of which are shown in the top pic, were a little too 1970s looking for me. They weren’t a modern brown, more of a Brady Bunch brown. I previously did not like cherry, but it was the darkest option they had in that price range. So I sucked it up this time. 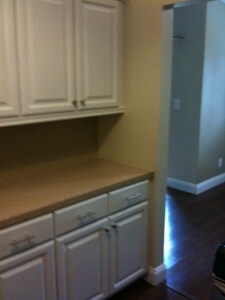 The countertop sample shown above with our cabinets is Corian in Bethany. Corian came standard in our kitchen, and there were only two beige options, so that choice was cake. 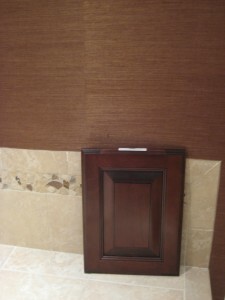 Then we chose this master bath cabinet and tile, the latter which blew the bathroom budget but I had to have it…. We also stuck with the stainless appliances that we loved before. 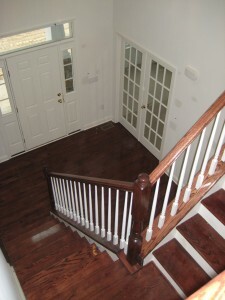 We are very, very happy with the way the hardwood floors turned out. Ecstatic even. They are no where near as red as I thought they would be and have a great variation in color which I love. 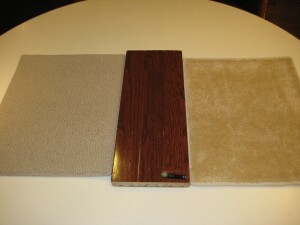 In fact, we are very, very happy with the way every one of our choices turned out, even that standard upstairs carpet that I thought was gold. It’s actually quite nicer than I thought! Our closing is on Tuesday. 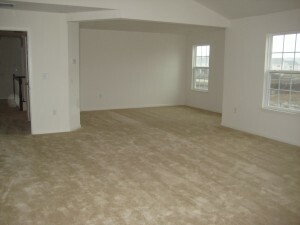 After 10 long months, we will finally have a home again. We’re painting within the week, as well as doing some other small projects, so expect many more pictures as we make our house a home! I haven’t posted in a while, but that’s okay because I also haven’t told anyone about this yet! We’ve been working a little bit on the design and direction of the site. But I’m back!! I spent this past weekend at what is becoming one of my favorite stores: Ikea. Ikea used to be known more for their quirky items, swedish meatballs, generally low (meaning in height) and cheap (meaning in price) furniture. But recently it seems that Ikea has been able to distinguish between cheap and inexpensive design, with even their furniture stepping up it’s game recently. Every time I go there, and we’ve been going at least once a month, I manage to find some treasure that I didn’t discover the last time I was there. This visit was unplanned and we didn’t expect to find anything, as we were just there about 2 weeks before. We went mainly to accompany my brother and sister-in-law and hang out with the nephew. 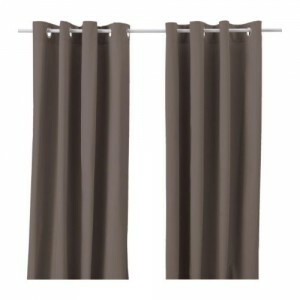 Our first find was these Merete curtains in brown for an affordable $39.99. 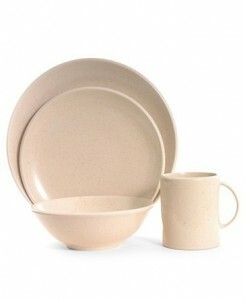 They are the perfect taupe-ish color we are looking to paint our living/dining room area. Window treatments for an entire house are a biiiig expense, so we were happy to find something reasonable that perfectly matched the style, color and vibe we wanted in our dining room. Plus they are a nice, heavy material that my curtain climbing cat will not be able to pull. After thinking about it, we want to pick up another pair for the opposite window in the living room. My beef with Ikea curtains is that, out of convenience, you have to hem the bottom with their iron-on hemming strips. 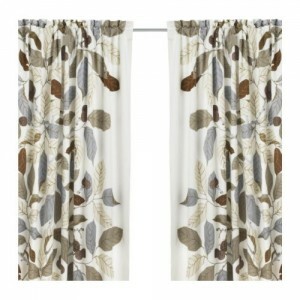 We already own these Ikea Stockholm Blad curtains from our condo, which I still love. 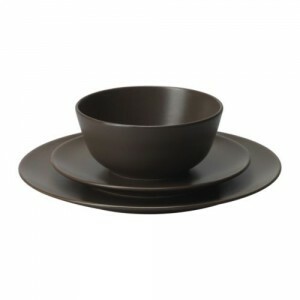 These are listed on the Ikea website for $14.99 for 6 place settings. We picked up the brown and the beige to mix and match. The funny thing about these ridiculously inexpensive plates is that we registered for a Calvin Klein set which exactly resembles this. 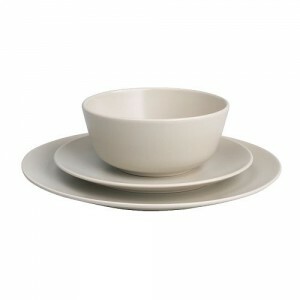 One (that is 1) place setting of the CK version was $49.99- on sale. We registered for 12 and only got a few. So we were able to pick up 12 place settings of this Ikea version for a whopping $30!! Here is the CK version in the beige…. Yes, they matched right down to the color choices. The only difference was that the Ikea sets did not include mugs, but who really uses them when entertaining? Our guests prefer booze.